Hot Chocolate has been a favorite for hundreds of years. It all started with the Aztecs, who used to drink “Xocolatl,” an unsweetened version of hot chocolate that included green chili peppers and unsweetened cocoa. While the bitter taste of Xocolatl may not be up your alley, there are plenty of other options for those of us who love the sweetened version of this liquid chocolate delicacy. Hot chocolate has come a long way over the years. Now there are literally thousands of different recipes, with tons of innovative ingredients. With so many options available, you no longer have to settle for the traditional hot chocolate recipe. 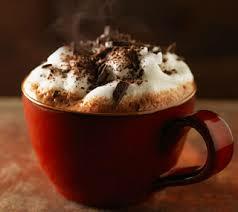 2) From Slim Palate, here is a “Thick and Creamy Coconut Milk Hot Chocolate” recipe. It’s perfect for those of you who need a dairy-free hot chocolate fix.